Warren Edward Spahn (April 23, 1921 – November 24, 2003) was an American left-handed pitcher in Major League Baseball who played for 21 seasons, all in the National League and was inducted into the Baseball Hall of Fame in 1973. Spahn spent most of his career with the Boston (later Milwaukee) Braves (1942, 1946–1964). He amassed 2,583 career strikeouts, giving him the third highest total in baseball history when he retired. His feat of winning 20 or more games in each of 13 seasons was also a record, as was his striking out at least 100 batters each year for 17 consecutive seasons (1947–1963). His total of 363 wins established a record for left-handers. Spahn was born in Buffalo, New York and was the son of an avid amateur baseball player. He grew up as a first baseman, but he was unable to win the first base job in high school, so he switched to pitching. His father built a pitcher's mound in the family's backyard and helped develop his son's pitching style. "He insisted that I throw with a fluid motion, and the high leg kick was a part of the deception to the hitter," Spahn told The Sunday Oklahoman in 1998. "Hitters said the ball seemed to come out of my uniform." He made his major league debut in 1942, pitching briefly for manager Casey Stengel, but recorded no wins or losses. Spahn was drafted into the Army's combat engineers in 1943. He took part in the Battle of the Bulge in December, 1944 and the capture of the bridge at Remagen, enabling Allied troops to begin crossing the Rhine. One minute before that bridge collapsed, on the afternoon of March 17, 1945, killing many American soldiers, Spahn had been alongside it. He emerged from World War II with a battlefield commission, a Bronze Star, and a Purple Heart for a shrapnel wound. In 2003, Spahn told a writer for Sporting News that, "because German soldiers often stole American uniforms at that point in World War II and spoke fluent English, anybody we didn't know, we'd ask, 'Who plays second base for the Bums?'" Spahn said, if the answer came back, "Eddie Stanky," OK. Otherwise, Spahn said, "He was dead." He returned to the Braves in 1946 and at the age of 25 won his first major league game. He finished the year with an 8-5 record, then emerged as one of baseball's best pitchers with a 21-10 record the next year. Spahn won more games than any other lefty (363) and is the fifth-winningest pitcher in Major League Baseball, trailing only Cy Young (511), Walter Johnson (417), Grover Cleveland Alexander (373), and Christy Mathewson (373) on the all-time list. He won three ERA titles, and appeared in 14 all-star games, the most of any pitcher in the century. He also holds the career record for most homeruns hit by a pitcher with 35. In 1952, the Braves finished 32 games out in their last year in Boston. Spahn pitched in the last home opener at Braves Field in Boston. Only 4,694 people showed up to see Spahn lose 3-2 to Brooklyn’s Preacher Roe. An earlier loss to the Cubs that year typified Spahn’s frustrating year when he fanned 18 batters in 15 innings and hit a solo home run, but lost, 2-1. He finished the season with a 14-19 record. At the end of the 1952 season he decided to change his pitching style. He developed a screwball and also added a slider, giving him four quality pitches. As a result he had his best season in 1953 with a 23-7 record and completed 24 of 32 games. He also picked up three saves and led the National League with a 2.10 ERA. He received a salary of $25,000 for both the 1952 and 1953 seasons. In 1957, at the age of 36, Spahn led the Braves to the pennant with a 21-11, 2.69 record, and began a string of five consecutive seasons leading the National League (NL) in wins. In the World Series, he won Game Four in relief as the Braves beat the Yankees in seven games. Spahn capped the year with the Cy Young Award as the Major League Pitcher of the Year. His salary for the year was $57,000. Spahn improved to 22-11 in 1958, and won two more games in the World Series rematch with the Yankees, in which New York prevailed. Spahn lost the Cy Young by five votes to four to Yankee Bob Turley. Spahn threw two no-hitters, his first came on September 17, 1960 against the Philadelphia Phillies, in his 567th major league game. Spahn also set a Milwaukee club record with 15 strikeouts in the victory. The second occurred the next season, April 28, 1961 against the Giants, just six starts removed from his first. Spahn was 40-years-old at the time of his second no-hitter. In 1963, at the age of 42, Spahn became the oldest 20-game winner. It was his thirteenth 20-win season, tying Christy Mathewson. In 1964, he slipped to 6-13 and the Braves sold him to the Mets, who made him the highest-paid player in their three-year history with a $70,000 salary. Also serving as a coach and pitching once more for Casey Stengel, Spahn was 4-12. After losing 11 straight on a last-place team, he was released in mid-July 1965, joined the Giants and went 3-4 for them to close out his pitching career. Spahn did not leave gracefully, grumbling, “I didn’t quit; baseball retired me,” and he pitched briefly in Mexico and in the minors until 1967 before finally giving up for good. In 1966 he was a pitching coach and occasional pitcher. He picked up one win as the Mexico City Tigers won the Mexican League Championship. He was elected to the Baseball Hall of Fame in 1973, his first year of eligibility. Spahn died at age 82, apparently of natural causes, at his home in Broken Arrow, Oklahoma. He is interred in the Elmwood Cemetery in Hartshorne. 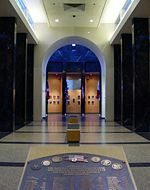 The Warren Spahn Award, established in 1999, is presented annually by the Oklahoma Sports Museum in Guthrie, Oklahoma to the top left-handed pitcher in Major League Baseball. The award is based on a combination of wins, strikeouts and earned run average during the regular season. Past winners have included Randy Johnson, (1999-2002, Arizona), Andy Pettitte (2003, New York Yankees), Johan Santana (2004 and 2006, Minnesota), Dontrelle Willis (2005, Florida), and C.C. Sabathia (2007 Cleveland). In August 2003, the Braves unveiled a statue honoring Spahn in the plaza outside Turner Field in Atlanta. Spahn, in a wheelchair, traveled to Atlanta for the dedication of the 9-foot-high bronze monument, which features his high leg kick. After his death a street was named after him in Buffalo, New York. It is located near South Park High School were he graduated just before signing his contract with the Braves. ↑ Richard Goldstein, 2003, Craftsman of the Baseball Mound for 21 Seasons Nytimes.com. Retrieved December 6, 2007. ↑ Warren Spahn Entertainment.howstuffworks.com. Retrieved December 6, 2007. ↑ Craftsman of the Baseball Mound for 21 Seasons Nytimes.com. Retrieved December 6, 2007. ↑ Dave Kindred, 2003, Spahn knew how to play hardball, Findarticles.com. (Sporting News). Retrieved December 10, 2007. ↑ Spahn is commonly ranked sixth after nineteenth-century pitcher Pud Galvin, who won 364 games. Galvin's first four wins came in 1875, in the National League predecessor National Association (NA). So whether Spahn or Galvin ranks fifth depends on whether the NA is considered as a major league. ↑ Warren Spahn, Tireball.com. Retrieved December 6, 2007. ↑ Warren Spahn Award Oklahomasportsmuseum.com. Retrieved December 6, 2007. ↑ Hall of Famer, 82, won 363 games, Espn.go.com. Retrieved December 6, 2007. All links retrieved May 13, 2014. Warren Spahn Stats – Baseball-almanac.com. Hall of Famer, 82, won 363 games – Espn.go.com. Warren Spahn, 82, Dies; Left-Handed Craftsman of the Baseball Mound for 21 Seasons – Nytimes.com. Braves in his blood – Georgiamagazine.com.